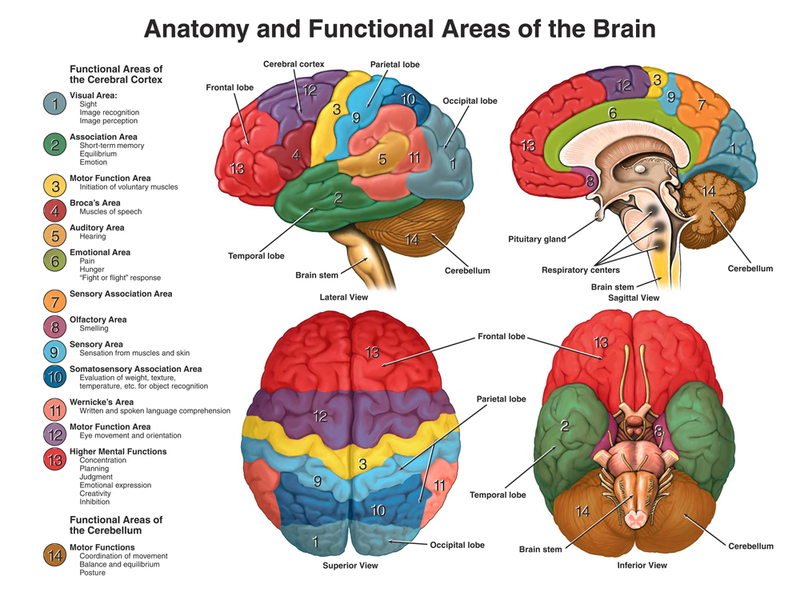 Anatomy and Physiology of wine tasting as appeared in part 2: https://wine4soul.com/2012/12/08/wine-sight-receptors-brain/ continues… How We See Colour? 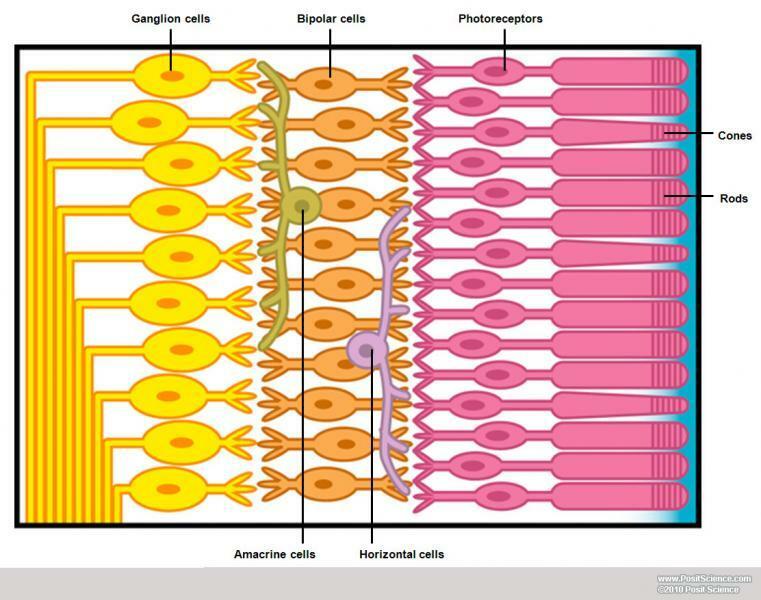 There are millions of colour photoreceptors; cones in the retina, and three different types of cones, each type of cone is sensitive to a different wavelength of light. Different wavelengths correspond to different colours. When light strikes a photoreceptor it releases a chemical that begins a process that enables the brain to recognize the “right” colour. In order to see colour properly, all three types of cones must be present, or the person’s eye will not have the photoreceptor that reacts to that particular wavelength, and colours are a combination of a variety of wavelengths. 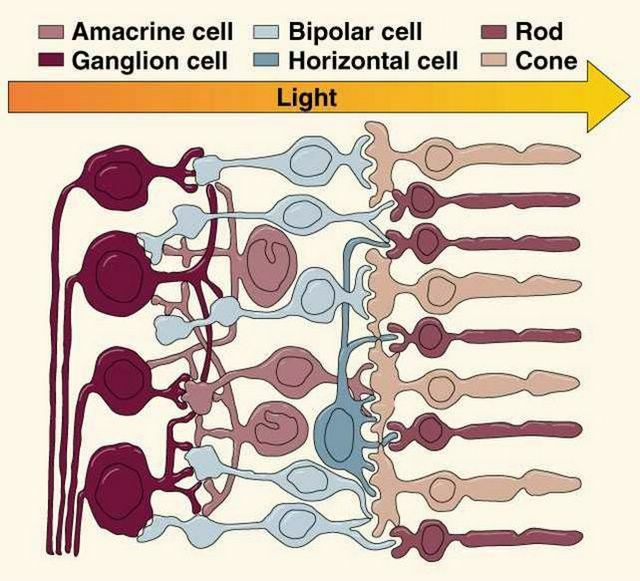 The chemical stimulus, from the cone to the brain that enables colour vision is facilitated through a chemical reaction of the reflected light with a light-sensitive protein called: Rhodopsin, which is present in the disk membranes of rod cells, and causes a reaction that acts as a trigger inside the cell. Rhodopsin requires the help of an intermediary chemical called the G-protein (I guess this is complicated enough). The human eye and brain together translate a certain reflected light into colour. 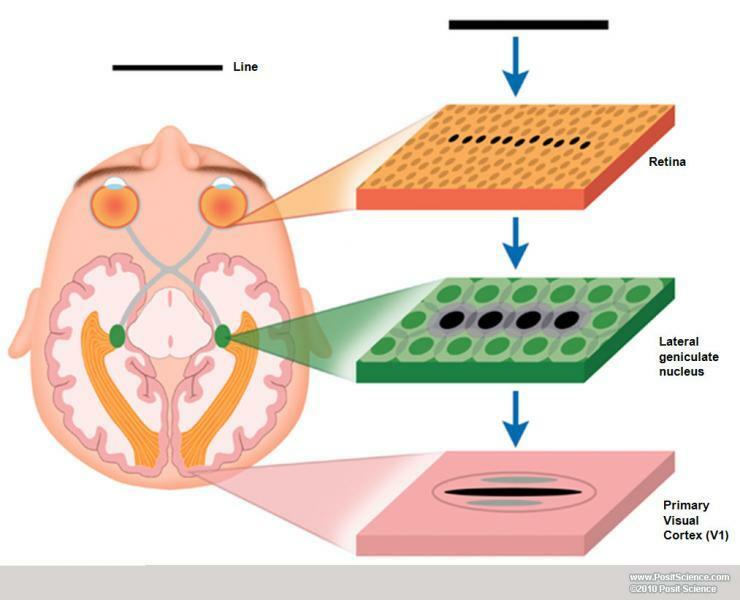 Light receptors within the eye transmit messages along the optic nerve to the vision center in the brain, which produces the “recognition” of a certain colour. The brain’s neural mechanisms also uses “memory” and experience to help with speedy identification, of which colour belongs to what object, so we do not mistakenly see a translucent wine in a red glass. Without the neural processes of the brain, we wouldn’t be able to understand colours of objects any more than we could understand words of a language we hear but don’t know,” said Steven Shevell, color and vision specialist . The surface of an object reflects some colors and absorbs all the others. 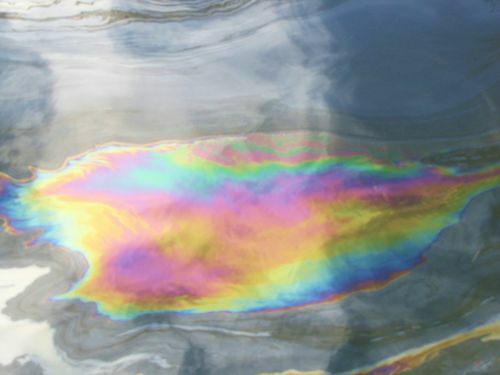 We perceive only the reflected colors. Thus, red is not “inside” red wine. The surface of the wine reflects the wavelengths we see as red and absorbing all the rest. The immediate process of judging a colour begins in the retina, which has three layers of cells. Signals from the red and green cones in the first layer are compared by specialized red-green “opponent” cells in the second layer. These opponent cells compute the balance between red and green light coming from a particular part of the visual field. Other opponent cells then compare signals from blue cones with the combined signals from red and green cones. The human eye can perceive more variations in warmer colors than cooler ones. This is because almost 2/3 of the cones process the longer light wavelengths (reds, oranges and yellows). All the above depend on their grape origin and variety, plus the wine making method. Although they may exhibit exquisite colour array, these wines are rarely suitable for keeping more than 2 years beyond their vintage year. Their colour is not as stable as most reds and quality white wines. Blue & red Anthocyanins which are present in the grape skin dissolve into the grape juice while crushing than before the fermentation process, the juice and skins are moved into the fermentation tanks, and because anthocyanins are soluble in alcohol they tint the liquid RED. The style and “depth” of the pressing process facilitates their dispersal into the wine. The dissolved Antocyanins are the contributors of the red / purple color of red wine. The aging process of wine in oak barrels and in the bottle tie these dyes to tannins to form long and heavy tannin molecules become less lively, loses a little from the purple shade and develops into shades of Red that vary, depending on the grape variety, region of origin, exposure to oxygen, climate/fruit ripeness before harvest etc.. Within a few years these molecules get “older” in a bottle and turn to rusty shades of red to maroon or even brown. 2. Purple- Crimson: Dark red color with a little blue. This is the color of most reds from all over the globe including those of Bordeaux and Bourgogne in their youth immediately after bottling. 3. Red Bordeaux: Bordeaux wine colour: colour that is colour of the majority of Bordeaux wines during the transition between shades and hues as they start to mature, as they approach readiness and full maturity, Scarlet. The English used to call it CLARET a red wine from Bordeaux. Indicating it being also clear. 4.Cherry- Bright Red: The higher the wine’s acidity (low pH) amount of red pigment to a higher and more active radiating health and indirectly implies the ability the wine’s ability to preserve fruit flavors for a longer period, with chances of maturing in proper balance increasing. Cherry is also the colour of fresh Sangiovese, and Zinfandel. 5. Brown-Red Tile: The colour of the fully matured red Bordeaux wines. If this colour appears in a relatively young wine, it usually indicates exposure to intense heat in various stages of the wine-making process, including the period before the harvest (extreme heat wave), or over exposure to oxidation in the barrel. 6. Reddish Brown mahogany colour – milder than the above, less extrovert colour, is the shade of a typical high quality red Bordeaux wines aged 15-30 years or less, fully “ripe” and ready for drinking, or unfortunately wines from a lesser origin , beyond their peak showing signs of fatigue. 7. 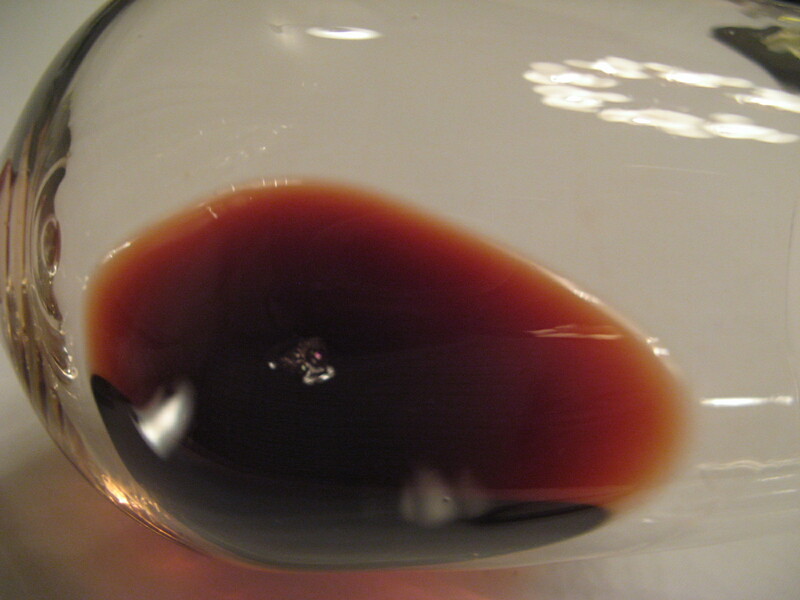 Orange-brown colour of wines more than 30 year of age that might have oxidized to oblivion. This color is missing a spark and suggesting the “death” of the wine we look at, wine gone bad? Ruby ; the color of the polished ruby gemstone: a more evolved but still youthful shade also the colour of young Pinot Noir, or Tempranillo. Lust: is a rich shade of red. Crimson: is a strong, bright, deep red color combined with some blue, resulting in a slight degree of purple. Maturing wines tend to change to Brick red: paler shades associated with older but still healthy wine, sometimes Copper as in Aged Grenache, Brick red Mature Pinot Noir, aged Bordeaux, Garnet as in Cabernet Sauvignon, Merlot, Nebbiolo. Wine colour’s depth or opacity measure of how dark is the wine. In wine tasting, the depth of color results from the concentrations of color and the wine substance, the more deep the color the less light to passes through it and it will appear darker, or “richer” in colour. Wines with less depth may appear diluted, watery almost transparent. Depths of wine colours vary greatly depending on the grape variety used to produce the wine, the vintage conditions, production process methods: fermentation steel or oak vats, aging methods before and after bottling. 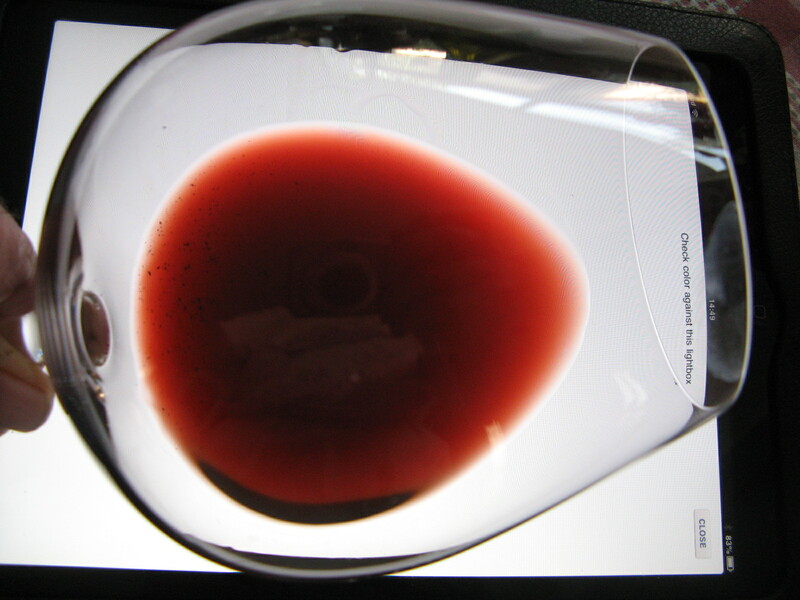 Depth of color, when used as a measure of quality, typically applies to red wines, as they naturally contain more coloring, tannins, and other components that can alter the wine’s depth. depth of wine colour is defined as: watery, pale, medium, deep, dark, or opaque. Various types of defects in manufacturing – affect Wine faults in clarity. 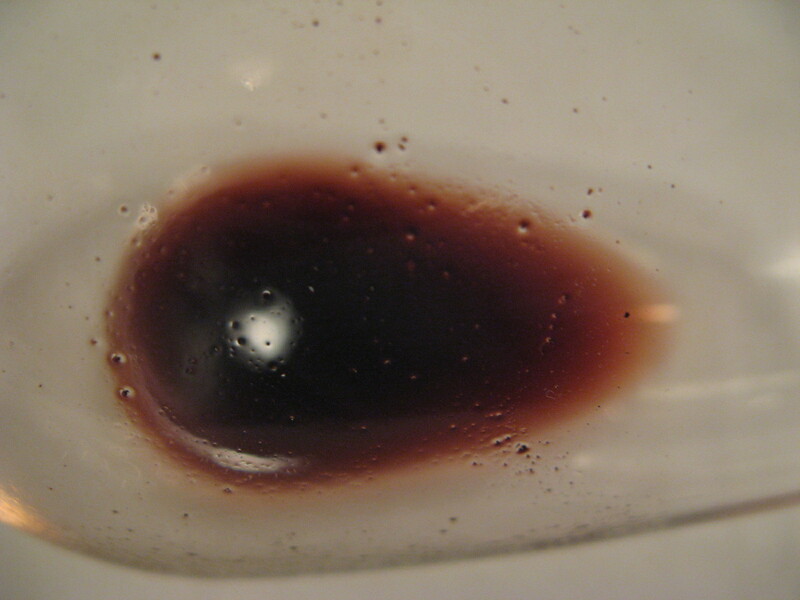 Wine with faint colors that do not sparkle may suggest a flaw, Light cloudiness such as milky appearance, reminiscent of the appearance of whole unfiltered apple juice.Some wine fouling is associated with air pollution or related to metal parts (iron or copper) or residual products in genetically engineered residual yeast and in wine that was not filtered or sank at the bottom of tank / barrel..
An old wine with sediment that was violently shaken prior to its opening, will introduce dairy cloudy effect even though it has no real fault, but it may tarnish the visual enjoyment from the wine and as we see this is an important introduction to our primary approach to the wine. Faded or dull colours in wine appearing “unpolished” might refer to a fault, surface of wine after pouring to the glass should appear shiny if it has “stains” reminiscent of oil floating on liquid, or as a soap bubble surface that reflects prismatic rainbow appearance all of these are an indication to a fault in the wine or contamination that is problematic. Small bubbles remaining for a very long time around the rim of very mature / old wines might refer to over maturity… the wine yielded to the “pressures of time” and is beyond its peak. The hue of a wine color is the inner definition of colour description beyonf the basic colours: red, yellow, pink. Your own interpretation of what colour you see and how would one describe it? When you describe what you see, association comes into mind and affect the semantic interpretation of what you actually see.In white wines the most common descriptions would be anything from transparent through greenish to yellows in varying depths to gold and amber. 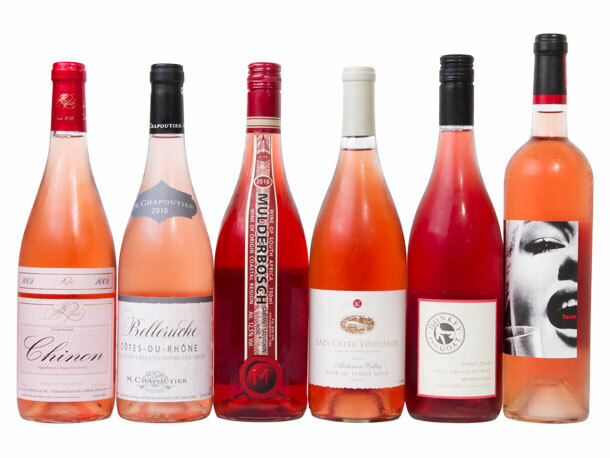 Rosé wines range from pink to salmon and orange. Red wines, from purple-red, ruby, to garnet brown and even black,. Take note if the color hue is consistent throughout the glass when tilted or does it form a rim of different hues. Some wines, particularly older wines will start to show color changes within the body of wine in the glass towards the outer edge – the rim or meniscus. Clarity was discussed on the previous post, As a rule most wines are relatively clear sometimes sediments are present in the wine they are residual fruit that sank slowly in the bottle, these sediment are not harmful and perfectly safe to drink it but may add a bitter taste to the finish if chewed. If sediments are stirred while pouring wine it can give the appearance of a slight haziness.As a rule, severe cloudiness in wine is considered a flaw. 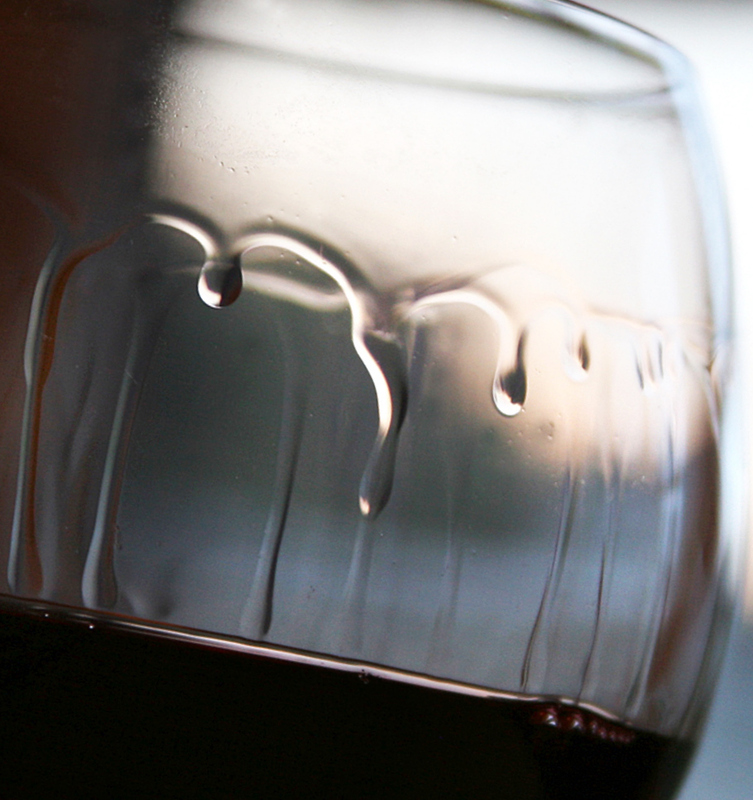 Wine “legs” are the stripes of translucent liquid that runs down the sides of the glass after swirling the wine. Sugar concentration is one of the several factors that influence wine legs. With higher sugar content, the liquid is more viscous. Therefore, dessert wines will always have much more pronounced legs. Another factor that influences increase in viscosity of wine is alcohol content. Since alcohol is more viscous than water wines with more alcohol will have more legs. Any compound that affects viscosity produces wine legs. All of these factors in wine Colour: shade, hue, clarity and depth are “met” by just the first sense in wine tasting: Vision and its sophisticated organ the Eye. And all these electrical signals that somehow are interpreted by our brain to what we call sight, It is a wonder, that is only partially understood (let alone explained) but that will have to do for now.